Castlerigg is an ancient neolithic stone circle - it was erected circa 3000 b.c.e., which makes it older than the giant sarsen stones at Stonehenge. It also has the honor of being the second largest stone circle in Britain. The prospect where the circle stands is a magnificent promontory that rises right in the center of the valley, under the majestic view of grand Blencathra. It is obvious why the site was chosen, it's in a cradle of the mountains that surround. There is not much in the way of folklore tied to the site, however. The typical "stones cannot be counted" is the only one that is regularly mentioned. But no particular tales attach itself to this place. Its other more recent claim to fame has been tied to Diana Gabaldon's Outlander series of novels. 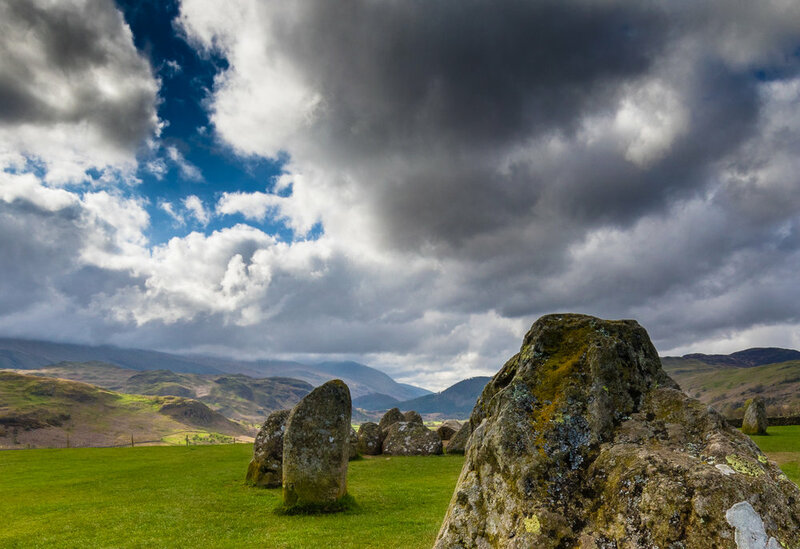 When the author herself visited the site after having written about the protagonist's traveling through time via a stone circle, she said that Castlerigg most resembled the fictional Craigh Na Dun stone circle that was in her novels.